We put in about four hours yesterday. Started working on Annes left eye, which happens to be her larger one. I've become acutely aware of my own eyes whilst working on this painting. I've become used to working very closely to my painting and looking over the top of my glasses. I am short sighted which means as my eyes age they are actually getting better for close-up work - I have to remove my glasses to read now. So it's been good for the small miniature paintings I've been doing over the last three years or so. 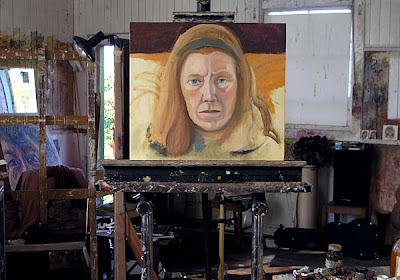 However, with a larger painting, and the constant refocussing between observing Anne and working on the painting, I'm finding it quite a strain on my eyes. I've tryed progressive lenses without much success and now I'm tryign the so called mono-vision ie: one lense for long range and another for close range effectively making me one eyed. Everyone has a dominant eye. Just as some people are left handed, some favour the left eye and vice-versa. Supposedly, when you use a camera, you put your dominant eye to the viewfinder. However, I always use my left eye for this. I'm not certain which eye is my doninant one and I suspect it alters dependign on what task I'm performing. So it was difficult to decide which eye I should have as the close range eye and which the long range eye. I think I got it wrong. When I start a painting, I of course have an idea of the colour scheme I'm aiming for. As I work on a painting over time however, I find that I try all sorts of subtley different hues and tones. It takes a while to work out what key the painting is in. It's very much like the key of a piece of music which can start in one particular key and modulate to another. 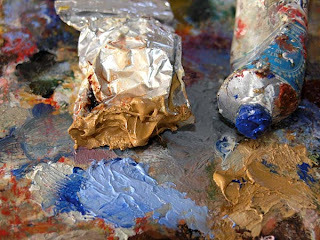 At the moment, on this painting, I seem to be hovering around the key of cobalt and ochre. Whatever key that is! I'm starting to get a feeling of chromium oxide however.... At present my green is Terre Vert. Wow four hours! I think if I was ever the subject of a painting my pose would have to be a sleeping one lol! 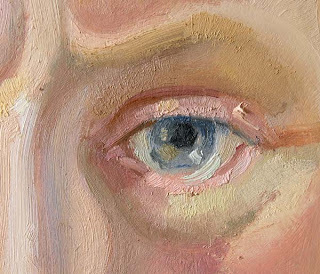 I loved seeing the close up of the eye ...interesting to see the painting evolving. Totally understand what you mean about the challenges of altering eyesight! Have been to Postcards from Puniho many times, and only today clicked on your profile to find this lovely blog. A few years ago, you invited Ellen and I into your studio, which was a true treat for me. The studio looks the same today as then, productive and busy, which is what ones studio space is supposed to look like, in my opinion. We are hoping this place of ours here in the States sells so we can be on our way to New Zealand soon, but we are assuming that it won't, as it is still our home. I hope to open my funky little studios/gallery next week. It will be an odd, eclectic place. That portrait is really looking good. I do SO enjoy your work. Well, we have lots of tea breaks! Thats why its difficult to get sitters! Yes, I remember your visit. Good to hear from you! Yes, I'm as busy and productive as ever though the studio is a bit cold the last few days! Best wishes with your new gallery!